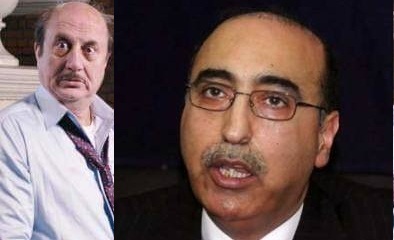 New Delhi: After facing flak for not granting a visa to Indian actor Anupam Kher, Pakistan today said it would expedite the visa process for all non-applicants from India in future. Kher, invited to Karachi Literature Festival, had not applied for the visa, and slammed Pakistan for not granting him the visa. “We have taken a lesson. We will expedite the visa process for all non-applicants, people who want to travel to the country but fail to apply for the visa, in future,” Abdul Basit, High Commissioner for Pakistan in New Delhi said while addressing a presser at his office. Basit said he tried to expedite the process for Kher too, but it was too late. Basit said that non-applicants who want to get their visa quickly will have to tweet their frustration out with the hastaq #anupumkin-visa. “All non-applicants have to do is simply tweet #anupumkin-visa, to alert our embassy staff who monitor twitter round the clock.” Basit said. New Delhi has welcomed the step taken by Islamabad.